Growing up as a raw vegan kid, Daniel always had a different view on food and health than his fellow classmates and friends. But being different was never really a concern to him since he knew the reasoning behind his food choices. Rather than fitting in, Daniel was always more intrigued with encouraging others make healthier food choices. He was convinced that if others were exposed to reliable information they would make drastic diet and lifestyle changes. It wasn’t until his 3rd year of elementary school that Daniel began actively speaking on the topic in public. It all began one day when his teacher asked him to present before the class about his diet. After talking to his classmates about the dangers of GMOs, many began to trash their candy and unhealthy snacks and others told him how they switched to healthier alternatives at home. Daniel was thrilled and created a series of health presentations for kids. 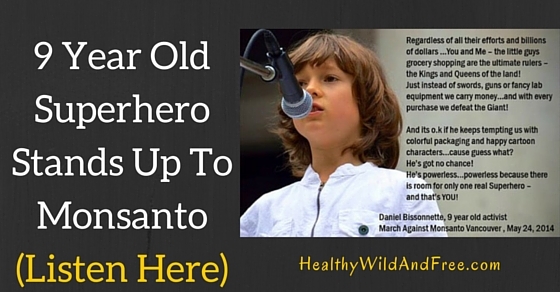 In May 2014, Daniel spoke at March Against Monsanto Vancouver. Little did he know, his words would not only leave the crowd memorized, but make headlines as one of the greatest speeches for MAM Worldwide! Shortly after, Daniel spoke at the VegExpo, David Wolfe’s events and participated in interviews with personalities such as Rachel Parent and Jeffrey M. Smith. Daniel is currently working on his upcoming book to be released in the summer of 2015, as well as, ongoing speaking engagements and educational videos. Stay tuned by joining him on Facebook and by subscribing to his YouTube Channel. Like his facebook page here and subscribe to his youtube channel here. A special thanks to Daniel for his time when he could have been enjoying more kid-like things! Please be sure to subscribe to the podcast in Itunes by clicking here and leave a review! Just when it seems like all the odds are against us, liberation arises from the least expected source. Among a generation of kids, many claim to be the most disadvantaged when it comes to food and environmental integrity, lie some of the most brilliant minds, kindest hearts, innovative thinkers, phenomenal artists and legendary leaders that have ever lived! This is the Birth of a New Era, a time when paradise on earth flourishes anew and unravels beauties beyond our wildest wonders!!! I agree, thanks for the comment Brigitte! What a smart little boy,I wondered since you brought him up to eat healthy what your take on vaccines are?